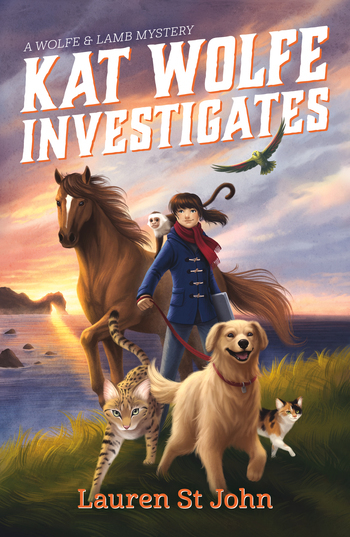 When twelve-year-old Kat Wolfe starts a pet-sitting agency, she soon finds herself unraveling a mystery, in this first book of a new middle-grade series from award-winning author Lauren St. John. After a break-in at their London home, Kat Wolfe and her veterinarian mum decide it’s time to move to the country. Dr. Wolfe’s new job on England’s Jurassic Coast comes with a condition: They have to adopt Tiny, a huge Savannah who resists Kat’s best attempts at cat whispering. Kat starts a pet-sitting agency to make pocket money, but then the owner of her first client, an Amazon parrot, vanishes from his gadget-filled mansion. Only one person shares Kat’s conviction that he’s the victim of foul play: Harper Lamb, an American girl laid up with two broken legs thanks to her racehorse. Kat and Harper team up, but what starts out as mystery-solving fun turns deadly for the duo. When all clues point to a nearby army base, can they count on their unruly animal friends to save the day—and their lives? Kat Wolfe awoke with a stiff neck and the creeping sensation that she was not alone. Lauren St John was born in Rhodesia, now Zimbabwe. After studying journalism in Harare, she relocated to England. She is the author of numerous books including the multi award-winning White Giraffe children’s series, the bestselling One Dollar Horse series, and the Laura Marlin Mysteries.